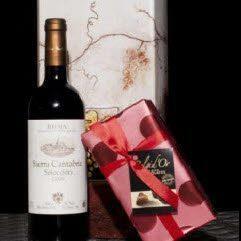 1 bottle of wine, Sierra Cantabria 2015 Rioja and a box of Belgian Chocolates 190G We can add a card to the gift. We have a selection of free cards, Birthday cards and cards for different occasions. 1 bottle of wine, Sierra Cantabria 2015 Rioja and a box of Belgian Chocolates 190G. As for the red wines, the least expensive is their 2014 Seleccion from Rioja, which is 100% Tempranillo aged in a combination of tank and American and French oak barrels. The wine is soft and easygoing, with attractive tapenade notes intermixed with graphite, black cherry and toasty fruit notes.